Our greenhouse is done!! Of course we still need to finish a couple tiny things, like getting the tools cleared out, preparing the soil, and getting the shelves built. It’s finished enough for now. I absolutely love it. We built our greenhouse out of unfinished cedar, antique windows and our old front door. It’s really just an expensive tomato cover and place to story my ‘sensitive’ plants over winter. 2010 Potager. Greenhouse was built where you see the green bean trellis. Our new greenhouse! 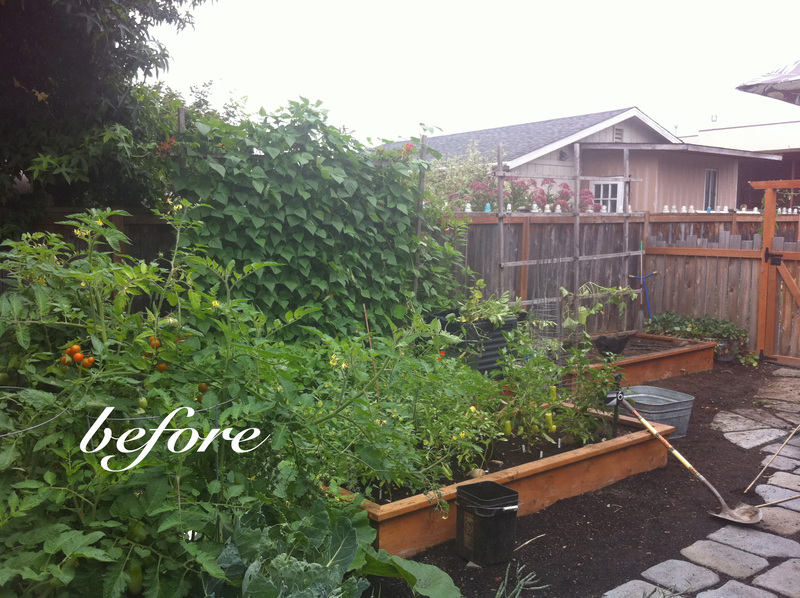 We simply moved the raised bed to a new spot in the garden. In the last picture, you can also see Stella and Mickey following me around. Angela, it looks Fabulous! You will love having a greenhouse. I can’t wait to read all your adventures! Happy Gardening! It looks great! Your garden is so pretty. You flatter me! Seems we’re both finishing up big projects just in time for the veggie growing season! Kari, I’ve been told there will be no vines growing in our greenhouse. Unfortunately, I have to share the greenhouse with Travis and we already disagree on what’ll be inside. We’ll add shelves and grow directly in the ground. It’ll be a mix. It looks great! I have been using a collapsable one for the last couple years. I just got it put back up and am getting ready to “stock” it. But now that I’ve seen yours, I want to try to build a permenant one too! It was a pain but totally worth it! Good luck! Man, I am impressed with both the before and after photos! I’d settle for either one of those. lol. BEAUTIFUL! I shall go and be green with envy for a while now. Wow, it looks fabulous. We have saved all our old windows from the house, hoping to build a greenhouse one day as well. Thanks for the inspiration. You should totally do it – would look amazing next to your beautiful home. Hope you’re enjoying the sunshine – you’ll be back to your projects soon enough. My husband got me a greenhouse for Christmas. I cannot wait to get it up. Two more months. I will keep watching your blog to get ideas. Yours looks great! Thanks for the photos and good luck. Good luck to you too! Two more months will come faster than you think. I just love, love, love your new greenhouse. So cute and you will get so much use out of it. And I love the blue glass insulators on your planting bed boxes too. Darling! It looks great! I just wish I had the space for one myself… by the way, the soil in your raised beds looks really healthy – what’s the secret? Thomas, our secret? We add compost, our chickens scratch around & poop on the soil (bad, I know), we use organic fertilizers (like fish emulsion) and cover with lots of organic matter in the winter that we till in each spring (by hand). It looks great! I’d love one someday, but for now I’ll content myself with following along with yours, I hope. Jenn, thanks for your kind words. Nice! There seem to be some very impressive carpentry skills on display at Chez Davis. Awesome! You are so enterprising. I hope I can have a small greenhouse someday. Beautiful! I really love the way it turned out – congrats on a job well done! Can’t wait to have one in my garden. Your greenhouse looks amazing!!!! I was thinking of building my own greenhouse. What are some tips you have? Can you post pictures from start to finish of which plants you planted and how you did them like from seed or from cuttings? The economy s so bad right now alot of people are looking for ways to save money. My fiancé and I stumbled upon your greenhouse picture when looking for a few ideas. We know we want to use recycled windows and when we saw yours we fell in love. Can you provide some insight on your building process and how you attached the windows to the frame? Great work. Your backyard is a dream! I would also like to know your ‘process’. I have the windows but don’t know where to start! Did you construct the walls first, etc? Pat, I found it helpful to draw out a plan on a sheet of paper. We started with the window and door measurements, added the 2×4 framing measurements , and then the four corner posts. That gave us the overall size of the greenhouse. The size of the greenhouse and wood needed revolved around the windows. The top row of windows are also hinged so we needed a little extra room to get them open and closed — then used trim on the inside to close any gaps in both rows of windows. Drawing it all out helped a lot. I hope this helps!